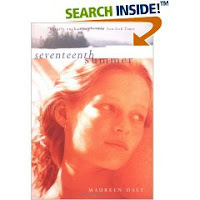 Seventeenth Summer by Maureen Daly. Library copy. Angie, a recent graduate of a small, all girls school, meets Jack, a popular kid who just graduated from the local public school. They start to date and she gets pulled into the popular crowd; she'll be leaving for college in the fall. Jack won't. Angie has no idea what to do with all her feelings and emotions, as she moves past childhood. A haunting, lyrical book, where, quite frankly, nothing much happens. This is about the journey, not the trip. I'm sure this can be viewed as "clean" romance; Angie questions whether it's OK to kiss Jack on a third date, even though she likes him; a declaration of love stops the world; she doesn't understand what "necking" is, or the "fast" reputation of certain girls. But. But. There is so much more here, obvious to the reader who is, well, a little big older. And wiser. The couple who are in the back seat of the car and so quiet. We know, or suspect, what they are doing, even tho Angie does not. Just as we wonder at the inclusion of the young Dolly, from the poor family, going out with "the crowd" and drinking beer. There are the couples who disappear, the places people park. But, most tragically, Angie's older sister, Lorraine, home from college, who wants, yearns, for something more out of life and is also lonely. Lorraine's sad story is the dark side of the AndyHardy movie like romance of Angie and Jack, with its chaste kisses and whirlwind of unknown (so unacted upon) feelings and emotions, where holding hands is overpowering. Lorraine meets Martin, in his mid to late 20s. From the text, it's clear that Lorraine wants and needs a boyfriend; and that she has broken "the rules" by accepting dates within too short a time period and calling a boy. From the comments she makes to her younger sister, I wonder. While a strict reading of the text makes it seem that the only lesson is, "don't accept a date too quickly or the boy will not really care for you," just how far did Lorraine go, in trying to keep and capture Martin? Happily, the only "punishment" Lorraine suffers is the gaining of knowledge. Oh, and Martin drops her, coldly, cruelly. Lorraine returns to college, having lost her innocence; even if she didn't sleep with Martin, she is a bit colder in her heart. But in looking up more information about the author, I discovered that Maureen based the sisters in her book on her real life sisters. In real life, Lorraine was Kay Daly Leslie, who became a vice president of Revlon important enough to warrant an obituary in Time Magazine. Yes, I thought, she made it out of the small town and did indeed find what she was looking for. The writing beautifully captures a summer and a summer romance; of wanting and yearning and searching and thinking. And I do wonder; how much did Daly herself know? A few times, the other characters comment on or react to Angie's being, well, "a good girl" who is unaware of certain things. Was Daly similarly ignorant about what the others were hinting at? Or was Daly well aware, and crafted the book knowing well what was OK and not OK for a teenage girl to write (and read) in the early 1940s? Because often, the writing is full of want and desire. Would teens today be interested in this book? I think those who liked Criss Cross. I think younger teens. And I think those teens who are, like Angie, more sheltered. Some communities have Nick and Norahs; others have Angies. This book is on our middle school's summer reading list (before anyone gets upset, so are almost a hundred other titles). A couple of years ago, a couple of teachers convinced the media specialist to take it off the list because they thought it was outdated and were sure it wasn't being read. I told him that in fact, I had two copies and that both circulate often, even during the school year, when the title isn't staring them in the face. So yes, some teens do still read and enjoy it. (It went back on the list, by the way.) It's nice for them to be able to choose between this and something like Gingerbread, which is also on the list (but not Nick and Norah!). Err...to clarify, I meant that Nick and Norah... isn't on the list, not that they shouldn't be able to choose it. Hey, that was a great book, I remember that book. This book is not just for the "sheltered." I know full well what is going on with my generation. I wouldn't call myself "sheltered" at all, I just choose to embrace the innocent side of growing up. I feel like this book is such a work of art because Daly captured the feelings summer and being young. Reading this book and thinking back on the past few years of my life (I'm 20), I can see so many times where she perfectly described things that I didn't understand then. Daly was such a great writer because she had a certain wisdom about life at such a young age. Most people say Angie was naive and clueless. I challenge you to read a little bit further into the text. Sometimes what appears to be naivity and being "sheltered" is just a wisdom that can't easily be seed on the surface. i first read this book in 7th grade and i loved it, i asked for it for christmas the next year, and i just picked it back up this month, and i fell in love with it again. i really like how Daly describes Angie's uncertainties because i felt the same way with my first boyfriend. i really really wish there was a movie for it. i would love to see it.